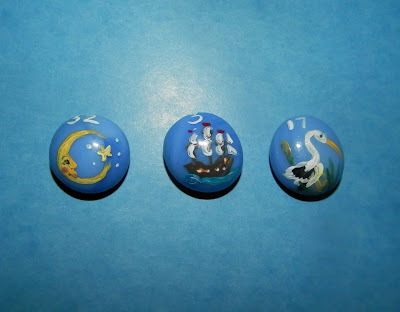 Today's Draw: Moon + Ship + Stork from the hand-painted Lenormand Stones by Robyn Tisch Hollister. Have you ever listened to someone else's problem and, though you have had the same issue, not shared your story with them? Think of something from your past that you don't share with others...why do you not talk about it? And if you're on the other/finished side of menopause, what's the good/bad/ugly that those of us who aren't there need to know? Reading Lenormand can be a very straightforward process of converting a card into a keyword and simply reading a sentence across however many cards you have. So if Moon=Recognition, Ship=Travel and Stork=Progress, then you have a sentence that reads, "recognition and travel bring progress" or "recognition progresses through travel" or some variation thereof. If you're just learning Lenormand, you'll hear that there is no intuition in reading it. That it's straightforward. But that's not true. Instead of your intuition coming from visual cues, as it does with tarot, your intuition is put into use by what keywords you use and how you combine them to answer the question. Each Lenormand card comes with a number of keywords that can apply. For example, while the Moon usually talks about fame and recognition, it can also speak of creativity, femininity, cycles, psychic ability and the arts. Ship usually suggests travel, but it can also signify a foreigner, separation, longing, departure or transition. And the Stork may usually signify progress or childbirth, but it can also speak to milestones, restlessness and change. So, unfortunately for the male readers, my first intuition when I got this combo was to talk about menopause (cycles departing and bringing changes to fertility). Throughout their 40s, women go through perimenopause, which is basically a slow torture of disturbing medical symptoms that could signal anything from a bad day to impending death. (I should note the experience is easier or worse, faster or slower, depending on the individual.) You might have trouble sleeping for a few months at a time. Or maybe you wake each night in a pool of sweat. Or the refrigerator section of the grocery store suddenly feels alarmingly hot. Or you're fine and happy one minute and a raving shrew the next. I call it a slow torture because you don't get all the symptoms at once. They come and go over as many as 10 years time before you even miss your first period. You can take all sorts of supplements and medications if you're into that. Or you can white knuckle it as I've done so far, seeking help only for the depression and mood swings. Then comes the waiting as you cross your fingers and count missed periods until you've gone a year. That's the menopause part. And it's another slow torture because all it takes is one spot of blood to start you counting all over again. I got all the way to 9 before I had to start all over again this month. All of this is the thanks you get for being able to grow a baby in your body. Our periods are part of both a miracle and a burden women bear and we rarely ever talk about it. Remember back in the days when women were institutionalized and given shock therapy for having "gone mad"? I'll bet many of them were on hormonal swings from either childbirth or menopause. Having experienced it myself, it does feel like you're going out of your mind. I wonder how many could have been spared by simply talking honestly with other women about what is a very natural phenomena. I know when I first started experiencing the sleepless nights, I had no idea it was perimenopause. I was only 40. My doctor said it was because I was stressed and needed more exercise. After about 6 months with virtually no sleep, I was at my wit's end. Then I started sleeping. As suddenly and inexplicably as I had stopped. Until then, I had no idea what perimenopause was, how long it could last or what the symptoms are. My mother never spoke of it. My sisters, my friends...nobody said a word. Today there are women out there who have been raped or abused or had an abortion and who feel all alone because nobody talks. On the flip side, there are women who have become CEOs and astronauts who never share how they got where they are. It's not so much that they don't want to help others, but they're either embarrassed or traumatized or whatever. These are things we don't talk about. There is a woman I know who has reached a goal I would like to reach and I have some rather personal questions to ask her about it. I've tried to ask a few times. I've known her for over 20 years. She's not talking. You have no idea how much your story can help another....especially when it involves the things that embarrass us, shame us or are difficult to talk and ask about. These are things others need to hear. It doesn't have to be blogged about, just talked about. And if you're afraid of being betrayed and your secret getting out, I get that. But it might also help you be less ashamed because you'd find out you're not alone, either. I share a lot of things on this blog for precisely those reasons. Some things are hard for me to put out there in perpetuity on the net. But I do it because I've always been fascinated about the things we just don't talk about...traumas, mourning, operations, bodily mishaps, addictions, depression, embarrassing events. That said, there are some things I keep to myself. I'm willing to share, but not with the entire world. Not yet. I often wonder how the world would be different if we all dropped our facades and allowed others to see our struggles and fears...our imperfections. All the energy we spend trying to maintain the image we've created for ourselves...what could we do with that? If we knew everyone was deeply flawed, how would that change the way we felt about ourselves? Just food for thought.